"NEVER AGAIN!" were the first words out of my mouth when I arrived home on Sunday after a grueling day of biking, driving and mis-adventures. I told Liz to record these words and play them back to me if I decided to sign up for the LiveSTRONG Challenge Ride again. 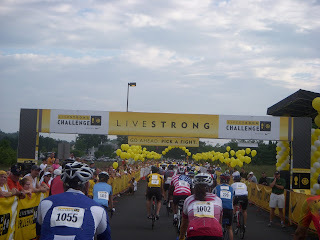 The 2009 Philly LiveSTRONG Challenge Ride was a tough day that started out on a sour note. I woke at 4:45 am after a fitful four hours of sleep. The day was hot and humid at 5:30 am. By 6 am when I arrived at Sue S.'s, things weren't any better. 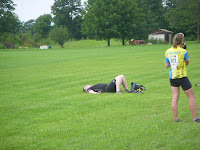 She was just as tired, if not more so, and was not looking forward to the day's 70 mile hilly ride ahead of us. Murphy's Law prevailed providing us with several mishaps in 20 minutes. Sue's garage door system failed and the door wouldn't close. Sue manually tried to close the garage door and jammed her fingers between two panels; her hand was trapped in the garage door and she was screaming in agony. I was strapped into the car passenger seat and couldn't unhook myself fast enough to help her. I leapt out of the car and tried, unsuccessfully at first, to pry the doors apart. More screams. I got her hand free but she needed ice and her house was locked - the keys were no-where to be found. Fortunately I had a frozen water bottle which we used to ice her fingers. 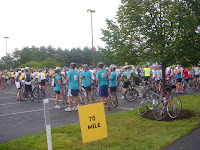 After a half hour of running around trying to locate keys and phone and fetching ice and medicine, Sue realizes she can't bike nor will she be able to drive to the start of the event; I'll have to drive - on the Schyulkill - aka '76, the big highway of my driving fears. It was truly a do or die kind of moment, but I did it. Stopped at a gas station first and then onto 76 and out to Conshohocken and Montgomery County. My first time driving on the Schuylkill was perfect at 7 am on a Sunday. Good initiation because the highway wasn't congested and I could figure out how to merge in the tame morning traffic versus attempting a mid-day/mid-week drive in snarling traffic. By 7:45 am, we already had several adventures and I should have taken it as an omen. 8 am: The start of the event, all of our Margaritaville or Bust Teammates at the bike start lines. Sue is unable to bike but plans to hang out for the day. My one other biking buddy, Susan B., is planning on riding 100 miles, but we figure we would ride the first 40 miles together. I should have known then the day wasn't going to follow my script. Susan B. and I start out fast, too fast for my pacing. I expend energy early that I should have reserved. There are hills, mountains almost, at the start and they don't let up. We get separated a few times; I witness wipe outs and spills around sharp turns; there are more flat tires and bike accidents along the first 21 miles that I lose track of how many SAG Vehicles and Police that have driven past me. 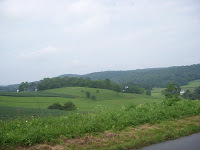 At mile 20, the scenery is beautiful and the country roads are cool and serene. I feel mostly mellow. Fellow cyclists are friendly and considerate. There are groups of people along the sides of rural roads cheering for us. One woman is standing outside of a huge old farmhouse, clanging on a triangle bell, wishing us a good journey. 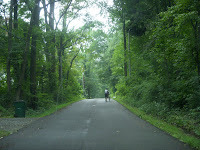 The first 20 plus miles are not easy but the rolling roads feel welcoming. Then I hit the woodlands. 11 am: Into the woods, the air begins to get thick and muggy. My knee is beginning to throb. Cyclists, experienced riders from the looks of their muscled and toned legs, are starting to dismount and walk up the hills. No one is talking; other than the birds and locusts I can only hear the heavy sucking sound of air being pulled into our mouths by the gulp-fulls. I, like the other cyclists around me, sound and feel like an asthmatic. My head and face are hot and flushed, and I'm only at mile 25. 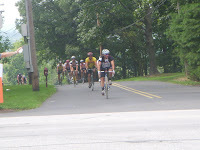 Somehow, I make it another 10 miles to the next rest stop in Barton, PA. Time to rehydrate, grab a bite to eat and regroup. I see a few folks on my team and chat, but like many riders, we all just want to get onto the next leg of our ride, so no one lingers for long. I hit the road again, biking past cornfields and dairy farms. The scenery is no longer enjoyable and I'm not entranced by the pretty farms with their lush green fields. Instead, I'm dreading the next descent because I know that along with a swift down hill 35 mile ride will be a difficult 8 mile an hour climb up the next hill. My stamina waning, my mind heads into some dark territory. I start thinking about Sue's injury and her not being on the ride. Susan B. is a stronger and better rider and went ahead of me hours ago. I'm riding on unfamiliar roads, nearly out of water. Panic sweeps over me like a sudden storm, dark and brooding. I pull over, sit along the side of the road and cry. Fellow riders slow down to ask if I'm okay, but how do you explain that while yes, I am okay, I'm also a wreck? I felt weak and alone, unsure of my ability and unable to figure out what to do next. I tried to pedal again but the hill is too much for me. A woman whom I've ridden past and chatted with a few times earlier stops to talk to me again. She makes me take my helmet off, pours cold water over me, and flags down a SAG Truck. At mile 42, I'm spent. 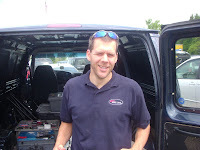 Joel, from Bike Line - Valley Forge, pulls his SAG Wagon over, loads my bike into the back of the van, and takes me to the next rest stop. 1:30 pm: Upper Frederick Fire Department rest stop. I drink a lot of water and ice myself down. Doctors are on hand to treat people for leg cramps and heat exhaustion. They are offering anti-chafing lotions and Ben-Gay rub downs. I take one for by this time, my left knee is in a lot of pain. The medic diagnosis my knee issues and advises that I get an appointment with a specialist soon - I tell her that I've already been diagnosed with arthritis, it's a chronic condition made worse by my cycling. There are "bubbles" in my knee joint. Great! Another bad sign of the day. More water, some rest and after a half hour or so, I feel revived. Maybe it's the camphor fumes, or just getting a lot of water in me, but I am felt strong again. I made a pact with myself, to try to ride to 50 miles and figure the ride out from there. Several people tell me that the worst is over but there are still many more hills to climb. I take solace in the fact that so many riders are feeling the effects of the heat and humidity and the endless hills, it's not that I am weak or inexperienced. Sometimes the conditions are too much for even the best of riders. I kid you not! This was the first rest stop out and the last rest stop before the finish line. I push into the last rest stop - giving it all of my energy having biked 55 miles. 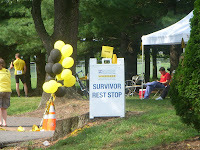 As I park my bike, an experienced and long-time LiveSTRONG rider chats with me. I'm sure he can see I'm in bad condition. I'm not as far gone as I was at mile 42, but I'm heading to loopy-ville again. He takes me to the medics and they talk to me, lead me to the cots under the pine trees and make me lie down. Vitals are taken, ice is given and a ride is procured. A minyan of angels has come along to get me home. I'm heading back in the SAG wagon having given it my best but I don't have another hill climb in me. 4 pm: Back at Montgomery Community College which was the starting point, the SAG drivers, Ally and Tom, let me out of the van several yards away from the bike channel so I could cross the finish line. Crossing the finish line feels wonderful, like something out of the Tour de France Stages. I survived and finished, doing what I could with the best of my physical ability. I raised over $800. I rode over 55 miles, mostly by myself. I biked alone but with the spirit and help of so many unknown cycling "friends" and supporters. Never again? Hopefully not, but I hope that whatever my next ride may be, I don't have to bike it alone.